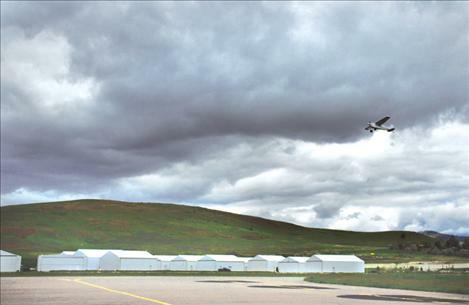 Clouds move in during the late morning as a pilot takes another load of Young Eagles up for a ride on June 9. Each Young Eagle receives a logbook to keep track of flying hours. Young Eagle Brenna McGuinness asks pilot Carmine Mowbray about the compass on Mowbray’s plane. 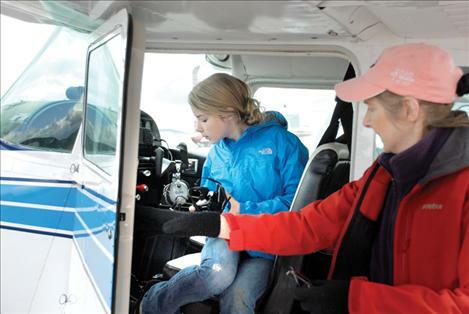 POLSON — The sun shone on Saturday morning, and local pilots flew with young passengers ages 8 to 17 as part of the Young Eagle program. Brianna McGuinness was one of the Young Eagles. She enjoyed the flight and had questions for pilot Carmine Mowbray about the compass and magnetic north. Another passenger was Levi Schmidt, 11, although this was not his first ride as a Young Eagle. Schmidt said he was thinking about being a pilot when he grows up. About 40 kids took advantage of the Young Eagles program sponsored by Experimental Aircraft Association Chapter 1122 on June 9. Pilots Mowbray, Chuck Jarecki, Nels Jensen, Trey Moran and Willie Stene took youngsters up in their planes and gave them a taste of the wild blue yonder. The chapter will sponsor two more Young Eagle flight opportunities this summer: one in Ronan during Pioneer Days and one in St. Ignatius during Good Old Days. Among all three events, the group expects to take about 120 kids up for a flight in hopes of getting them interested in flying. For more information, go to www.youngeagles.org.